Happy Valentine’s Day! Here is my latest, silliest collage based on Pheobe’s, of the show Friends, lobster love idea. Pheobe says to Ross regarding Rachel when he gets sad about her possibly dating another guy: “She’s your lobster…. It’s a known fact that lobsters fall in love and mate for life. You know you can actually see old lobster couples walking around their tank and holding claws!” Aw, Friends. This collage was made for two musicians in Milwaukee, Michael Clobes of Cold Sweat and The Brew City Horns, and Chrissy Dzioba of The Whiskeybelles (I’m a huge fan!). My good friend, Chrissy, commissioned the illustration art as a Valentine’s Day gift and wanted to represent the cities where they are from in the collage. Santiago, Chile is on the left and Milwaukee is on the right. Michael plays an Edwards trombone and the guitar in the art is Chrissy’s custom Gibson SJ-200 Bob Dylan Player’s Edition. 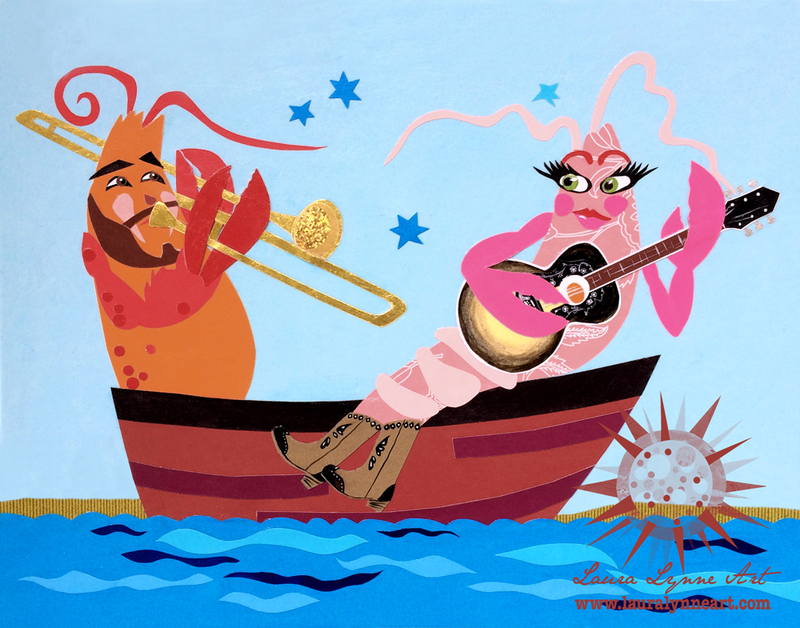 They are just two cute lobster musicians floating around in their row boat, and so in love. If you’d like a custom collage with your lobster for an anniversary gift (paper year, perhaps? ), engagement present, or any other occasion, please contact me. And, don’t worry if you haven’t found your lobster yet. I never thought I’d find mine, but it happened. Love to you all! Here is a link to purchase this lobster print. 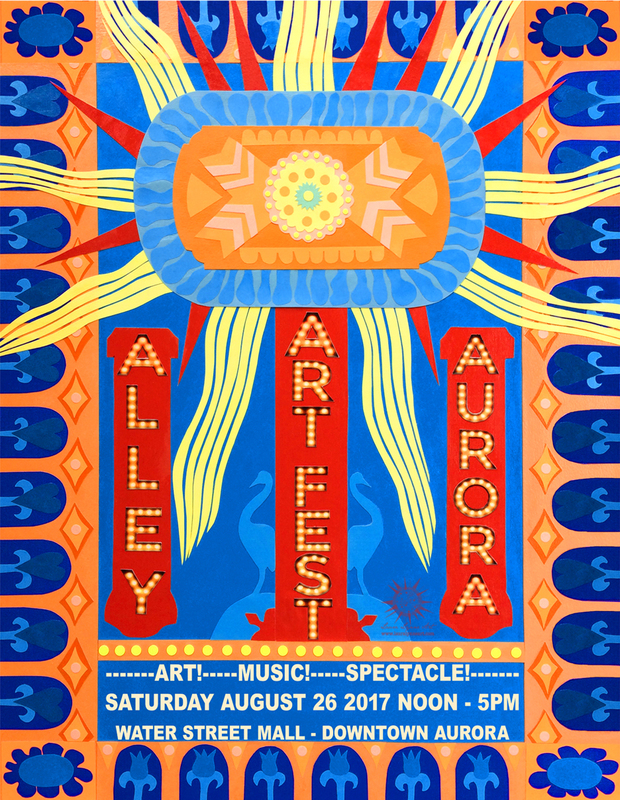 At the Alley Art Festival in Aurora, Illinois in August of 2016, I met the new Executive Director of the Aurora Regional Fire Museum, Brian Failing. 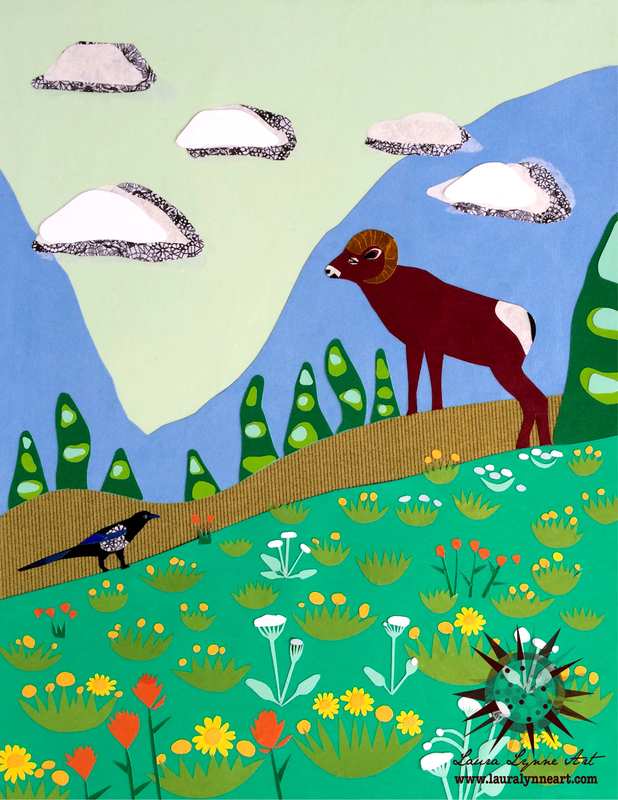 He asked me to do a project for the museum – a series of prints to sell in the museum shop. I started doing research at the Aurora Historical Society, digging up old photos of Aurora. It was really amazing to see what Aurora looked like in the 1800’s and early 1900’s. Seeing the photos of the beautiful buildings and crowded streets made me appreciate the city where I live more. I’m so thankful for that. Next, I went to the museum to do more research on the fire history and vintage fire trucks. Their library was so nicely organized. I collected a lot of material, including photographs of their fully restored fire trucks. Then I went to work creating three original collages. This museum is a unique gem in Aurora. The architecture is beautiful. If you have kids they have a very nice play area within the museum, including books, a fire house, fire gear to wear, and lots of toy firetrucks. I am so grateful to have been able to help a non-profit in my community. Thank you to all of the firefighters in Aurora and everywhere!! Do you love fire trucks? Are you planning a firefighter or fire truck nursery or kids room? 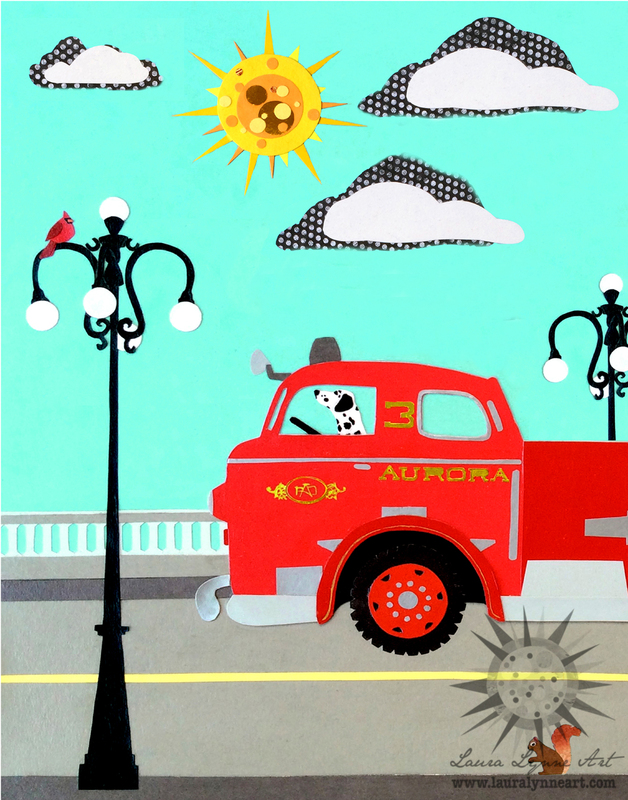 You can order a fire truck print with your city’s name on it and a reproduction of the Aurora Regional Fire Museum in my shop. If you’ve asked me to commission a piece of art, you can bet I am super excited! (If you are interested in commissioning art for your nursery or any other room, please contact me to see if I can meet your deadline this year.) Here is some information about the process of a commissioned artwork. -We’ll converse about your likes and dislikes, ideas for the piece. -Have you commissioned art before? If so, please let me know how many pieces and what you liked or didn’t like about the process. -What size do you want the piece? -What do you want to see in your art? -What is the main emotion or attitude you would like to feel from the art? -Is there anything you don’t like about my art or don’t want to see in your piece? -Will you be the only one approving the art? If not, please let me know the email address or phone number of the others involved. -Do you have any other questions or requests? -We’ll agree on a timeline, deadline and budget. -A portion (usually one third) of the total cost of the piece is due at the start for supplies, research and sketching. The vast majority of the creative work happens in the first few weeks of planning even though the art hasn’t even started yet. This is non-refundable. 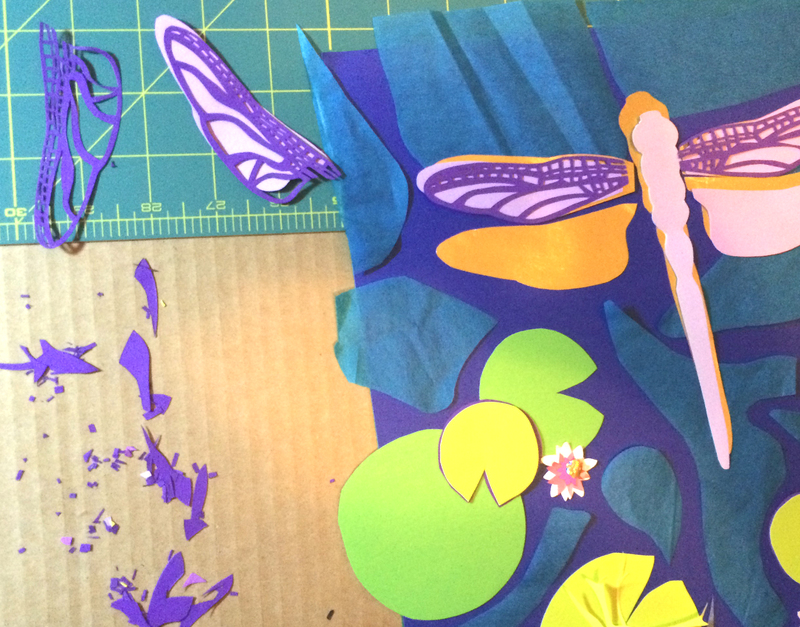 For example, the design chosen for the dragonfly collage was the one on the bottom right. -I’ll create 3-6 very rough sketches to figure out the placement of the design and objects (composition). This is very basic and doesn’t show color or detail. -We’ll talk about any changes, if necessary. -Please feel free to send me back to the drawing board if it’s not quite right yet, but remember this is just a very, very rough drawing. -After I start on the art, I will send you updates via text, or email frequently. -Please give me input along the way. Step Four Example: My client, Alison, gave me a lot of autonomy for this piece. I originally was going to make the background green, but then decided that the dark blue made the lily pads pop better. Alison agreed! A major change like this at the start of the process is easier than at the end. -This is the time where I work out color and design on the paper. 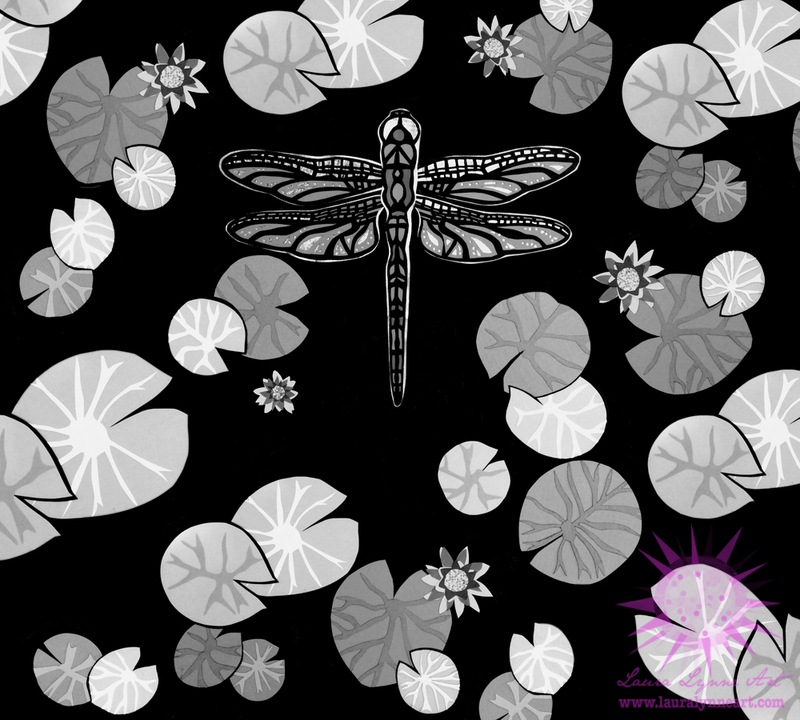 You can see (very faintly on the sketchbook) that I did a more detailed study of the dragonfly when it was time to start paper cutting. A lot of extra detail was added here – darker paper under the lily pads, for example. At this point I was undecided about whether I should do the solid gold, the lilac, the sparkly gold, or a combination, under the wings. Many more hours of work and it is almost done. I decided to do a combination of lilac and sparkly gold under the wings, blue paper in parts of the body. Details have been added to all the lily pads. Note: when using tissue paper (the blue/green in the water) it looks much different before it’s glued. -Before gluing, I’ll send a picture of the final artwork. -This is the last call for any changes. -All of the small pieces of the artwork are sealed with acrylic gloss medium and then coated with layers of acrylic medium and varnish. I dropped water on the tissue paper to create an effect. The background is finished here. -Please note the final artwork may have some bumps and/or bubbles in the paper. 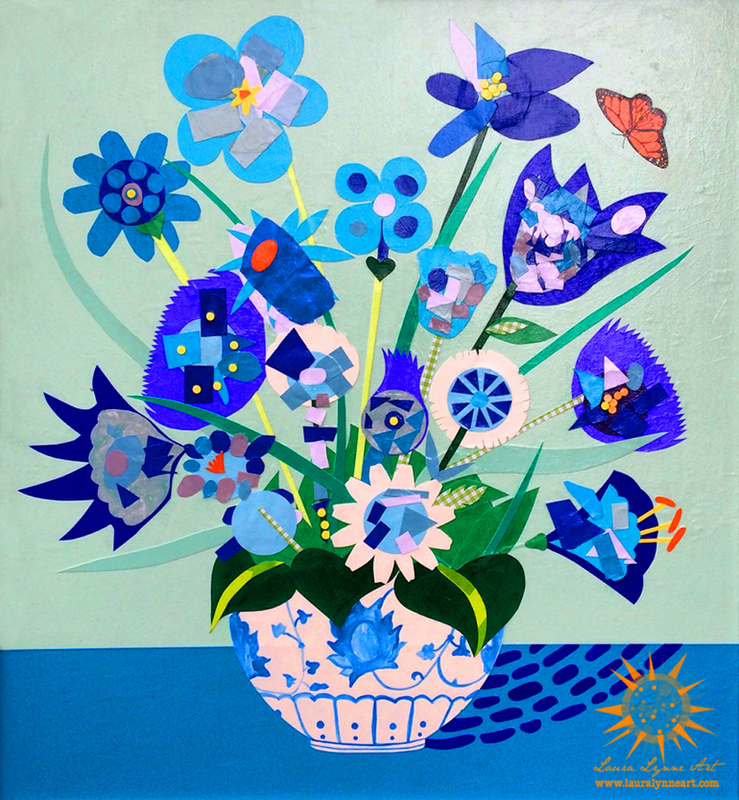 -All new artworks are created on wood panel and coated with varnish so that they can be hung on the wall as is. You may also frame the art as well. Dust with a dry cloth, if necessary. *Copyright of the finished piece belongs to Laura Lynne of Laura Lynne Art. Thank you so much for working with me. 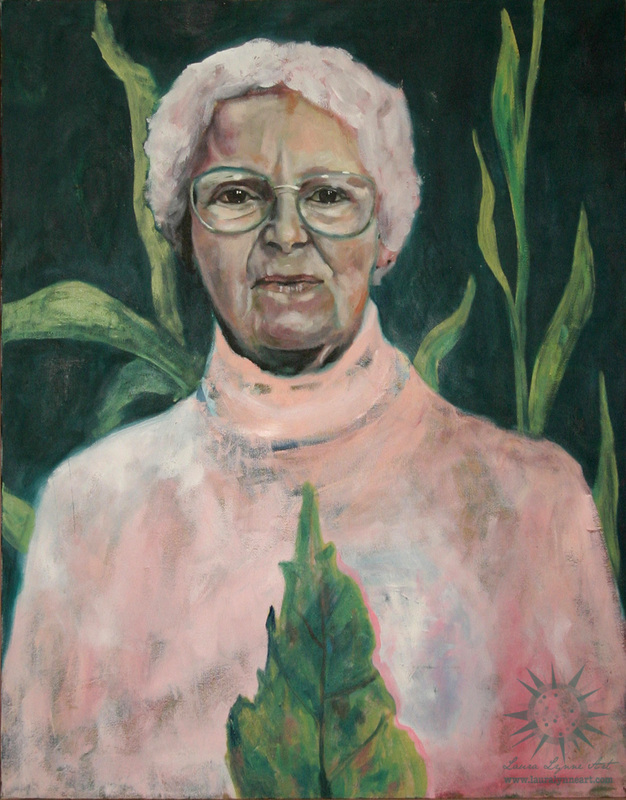 The idea for the astronomy series was inspired by my astronomer cousin, Dr. Rachel Osten. These pieces were done as a gift for her youngest son’s room. This is how the quote should read: “Be humble for you are made of earth. Be noble for you are made of stars.” It’s a Serbian proverb. My astronomy quote paper cut art displays the words backwards because I wanted the words and pictures to correspond. The Earth part is written in the earth and the stars part of the quote is written in the sky. 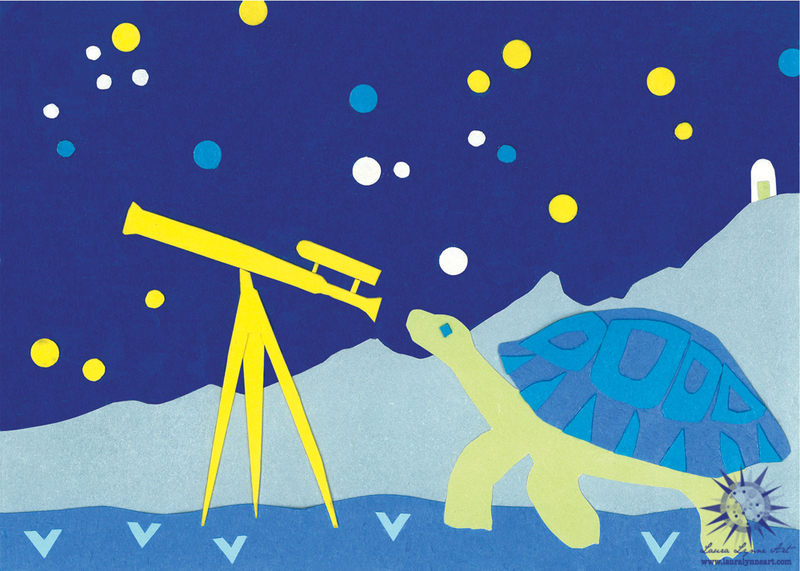 Here, I imagined a deer and turtle visiting an observatory late at night when all of the other astronomers have gone to sleep. They will gaze at the stars until the morning hours. A butterfly flies by the mountain observatory while the starry sky lights dance above. These blue, astronomy animal art prints are for sale in my shop.